Culturetopia: Music And Politics Edition This week: A band considers selling a highly coveted domain name, a world music master running for president of his home country, and a pop singer who got surprising attention for endorsing Ron Paul. On this week's podcast of NPR's best arts stories, our pieces range around the globe, touching on the intersection of culture and politics. From Morocco, a look at the imprisonment of a rapper whose music critiques the country's social problems. Then on to Canada, where a popular rock band is considering selling their website domain name — TeaParty.com, based on what's been the name of their band since the early '90s. Some internet analysts think it could fetch as much as a million dollars. And three Indian-American comedians discuss their U.S. State Department -sponsored tour of their familys' country of origin. Also, interviews with two superstars separated by four thousand miles-- world music master Youssou N'Dour reveals his plans to run for president of his home country, Senegal, and from her home in Nashville, pop singer Kelly Clarkson talks about how her endorsement of Ron Paul made her record sales jump 422 percent on one day. 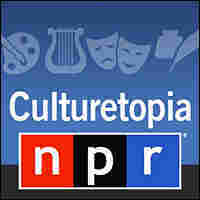 Subscribe to Culturetopia here or stream below.